"You can see me smiling but it's not been easy what we're doing today. There's a lot of tears." Six months after her brother and his longtime partner were killed in Orlando's gay nightclub massacre, Jessica Silva is re-opening the couple's beauty salon. Half a dozen black salon chairs are in place. 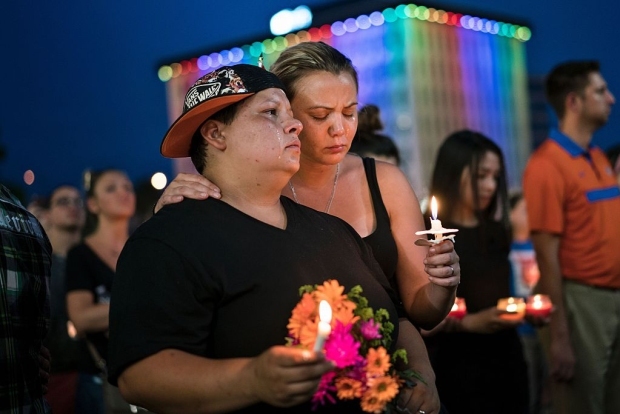 One of them faces a large photo of the brother Juan Rivera Velazquez and his partner Luis Daniel Conde, who died June 12 in the worst mass shooting in modern U.S. history. It's the same chair where Velazquez once styled hair. Velazquez's black toy-sized dog, Juicy, again roams the salon in a purple tutu, just like before. Velazquez's big sister, Jessica Silva, her mother and a cousin are ready to welcome back the customers who relied on Velazquez and Conde to make them feel beautiful. The two men had owned the salon for about six years. "I remember when he was starting, he said he was going to be an artist. He was going to make changes for women, make them feel more beautiful, free the best in them, and he did," said Jessica Silva, Velazquez's sister. She spoke Thursday, shortly before a small ceremony to reopen the business. Silva and other family members shouted "woooo" as they cut a red ribbon outside the salon in a strip mall. Later, they ate ceviche on cocktail tables. The new salon has a different location, and a slightly different name. Silva considered re-opening in the Kissimmee, Florida, space where it once was, but she and her mother were haunted by his memories there and decided to move shop five miles away to south Orlando. "My mom used to work with him. She worked behind him and when she moved her head halfway, she would see him," said Silva, who is five years older than her little brother, who was 37 when he died. "When she went back to the old salon, she started getting nervous and anxious." The name also is now D'Magazine By Juan P, instead of Alta Peluqueria D'Magazine, as a tribute to Velazquez. Velazquez and Conde were a couple for 16 years. Silva and her parents view re-opening the salon as continuing Velazquez's legacy, as painful as his absence may be. "This was his dream," Silva said. "You can see me smiling but it's not been easy what we're doing today. There's a lot of tears every time we put something that belongs to him, that was in another location, and he's not going to be here to tell us, 'OK, I don't want this here. I want this there.'" Velazquez's father, Ramon Rivera, said, "He left but he's here like an angel for me." The doors to the salon have been closed in the six months since Velazquez and Condo were killed in the Pulse nightclub, along with 47 others. Dozens of others were hospitalized, many with severe injuries. Gunman Omar Mateen, who was killed in a shootout with SWAT team members after a three-hour standoff, had pledged allegiance to the Islamic State group. Silva remembers being awakened by a caller, then rushing to find her brother. "A friend of us called us at five in the morning telling me that something happened there and they were there, and they posted pictures during the night," she said. "I got in my car and I went looking for my brother. But unfortunately, I had to wait 24 hours to find out that I was not going to be able to hold him, kiss him, and have him near us anymore." 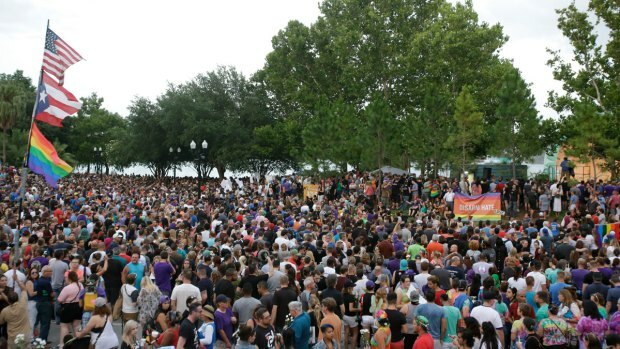 Monday marks the six-month anniversary of the attack, and hundreds of central Florida residents are expected to join officials in a memorial observance that day. The opening of the salon is part of the healing process for the family and the community, said Cheryl Grieb, vice chair of the Osceola County Commission. "They really wanted to keep the salon open because, initially, afterward, it was 'Do we keep it? Do we not? Finances?' It was a back-and-forth experience for them," Grieb said. "In the end, they knew that this is what he wanted and they wanted to keep that dream alive."